Darunta, Kabul, Peshawar, and some cities in Nangarhar, Afghanistan. Darūnṭa (Pashto: درونټه‎) (or Khayrow Khel), also spelled Daruntah or Derunta, is a village in Jalalabad District of Nangarhar province. It is located next to Jalalabad city on route AO1 in Afghanistan. It gave its name to the Darunta training camp located north of the village, across the Darunta Dam. 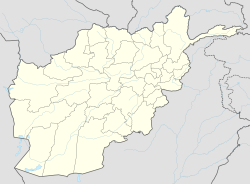 This Nangarhar Province, Afghanistan location article is a stub. You can help Wikipedia by expanding it. This page was last edited on 12 January 2018, at 16:26 (UTC).